7-1-100 Annual Report. The administrator of a program that holds ABAI Accreditation Board accreditation is required each year to submit a report to the ABAI Accreditation Board, providing statistical data and other information about the sponsor institution, program(s), faculty, and students. 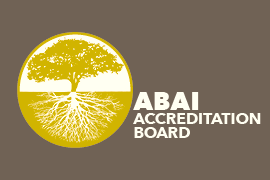 The information submitted in the annual report is used to update ABAI Accreditation Board records to help determine whether the program continues to comply with the accreditation standards. Information collected as part of the annual report includes enrollment data as well as data in other areas of interest. Annual reports are reviewed by ABAI Accreditation Board staff, and, if particular concerns or problems are identified, the reports are reviewed further by the ABAI Accreditation Board. The ABAI Accreditation Board can require additional reporting or a focused or comprehensive site visit on the basis of information provided in the annual report.